Football (Soccer) and Testing: Crazy!!! “Crazy” is a correct word for the match yesterday between U23VN and U23 Qatar. Crazy is not only in the way that U23 presented to their competitor and all audiences, but crazy is in the whole course of events of the match. Moreover, the “crazy” was not made by only 11 VN players, it has been wider with about 100-million VN people living with the football recent days. 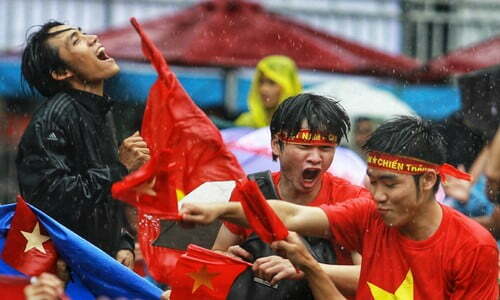 Critical events from politic to economy become less more important than U23 VN in about more than a recent week. We (U23) have just created an illusive milestone in Vietnamese Football as the team march on to the final round. They were doing the things that there were no previous generations could make it. But what made this “Crazy”? Passion: “Crazy” is constructed by the first element – Passion. If you fall in love with anyone, you will be crazy to do a lot of extraordinary things for him/her. If you fall in love with something (testing as an example), you will wake many nights to figure out more and more perfect ways to do it better. When you love testing and you are given a very challenging test for a complex application, you won’t hesitate to give up your hobbies at that moment and try at the best to find out the most beautiful solutions for that challenge. You won’t feel satisfied with yourselves when there is only one answer to a problem if you are very passionate about it. Passion is not created by nice words. It comes from recognizing the beauty. A developer loves coding is because he sees the beauty of his algorithms, of his coding styles, so he always wants to make them better. A tester has the passion for testing, he won’t see any border between testing types (among automation, manual, security or performance testing,..). All his doing is to design a perfect solution. Put the Pressure Down: Passion doesn’t have any room for pressure and discipline. In the match yesterday, U23 did not have any pressure to meet any given goal. Putting their team name into semi-final was very outstanding, nobody would blame them even when they lose the game yesterday. Because of this, they showed a game very attractive and very miracle. Similar to the life, when being under pressure of the goal, you cannot follow your passion. Instead of trying to do it better, then you try to make it happen (make it done). Someone said: “The more discipline, the better testing”. It may be right for a less mature team. Let give the freedom to your team, then they will take more responsibility and wisdom into their work. Some managers and clients usually define some metrics to measure the goal meeting. Good metrics will motivate the team spirits or reveals the problems. Bad metrics creates circumvention games and put the team under bad pressure. Then, they will stop improving their quality of testing work and promotes bad behaviours. In the life, let follow your passion and give it more room to be crazier. If you cannot identify what your passion, let ask yourselves what makes you crazy.